Sink your teeth into this soft and chewy candy bar that packs 20g of protein and an energy boost. These gluten-free, triple-layered, baked bars are made with science-backed premium whey protein to help support muscle growth and recovery from workouts! The Gronk Signature Protein Candy Bar is designed for everyone, from active men and women and fitness enthusiasts to high-performance athletes, powerlifters, crossfitters, bodybuilders, and anyone looking for a tasty source of clean protein that’s perfect for on the go! Our research team worked closely with some of the premier protein cookie experts in the world, and each flavor of MuscleTech® Protein Cookies has been painstakingly tested in internal taste tests. The result? An absolutely amazing-tasting cookie that delivers the protein and taste you’re after, with a chewy, soft baked texture and real chocolate chips that you can enjoy guilt free! Best-in-Class Formula – Compare for Yourself! Take a look at other protein cookies, and you might be shocked by what you find! Some of these protein cookies use inferior plant-based proteins, including wheat, and don’t have whey protein. They even have as much as 30g of sugar! We know that serious athletes need the results that only high-quality, leucine-rich whey protein can deliver, and MuscleTech® Protein Cookies deliver 18g of protein, primarily from whey, for a cleaner macronutrient profile with 8g of fiber and half the sugar than the competition. MuscleTech® brings you a delicious, indulgent, protein-packed treat: the best triple-layered, baked candy bar, featuring decadent chocolate, real caramel and peanut pieces. 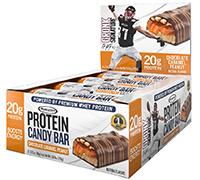 The Gronk Signature Protein Candy Bar is about more than just great taste. While other bars rely solely on whey protein concentrate, the Gronk bar features a blend that also includes whey protein isolate. It’s also lighter on the stuff you don’t want – with fewer calories, less sugar (only 3g!) and gluten free – making it a great part of any fitness lifestyle! To ensure a high standard of quality, each batch of Gronk Signature Protein Candy Bars undergoes strict quality control, and is third-party tested and verified to ensure that each batch meets the highest standards of purity, quality and consistency. All-Pro Tight End Rob Gronkowski presents the Gronk Signature Protein Candy Bar — the first protein bar that he developed with Team MuscleTech®! Does it taste like a candy bar? Yep. Does it deliver the gains? Yep. Is it awesome? Yep. It's #GronkAwesome.